About two dozen sympathizers braved minus-10 temperatures to attend a vigil on Wednesday, 22 January 2014 to mark the tenth anniversary of a suspicious death at the Law Courts Building in Edmonton, Alberta, Canada. In 2004, a handcuffed and shackled 16-year-old Kyle Young — set to appear in Youth Court — plunged five floors down an empty elevator shaft after being pushed through a closed, one-piece metal door. No one was charged in connection with the youngster’s death. A decade later, one concerned citizen still wonders why. It was around 11:40 Thursday morning, the 22nd of January 2004 when I walked out the west doors of the Law Courts Building — known simply as the Courthouse — and spotted a firetruck with lights flashing, parked out on the street. A possible story, I thought. At the time, I was reporting from the Courthouse for 630-CHED Radio. I approached a firefighter who was busy grabbing some rope and asked what was going on. He looked my way, cursed and slowly shook his head from side to side. The guy was some pissed off. But not at me. He was appalled at something he’d just seen in the bowels of the Courthouse. With a good length of rope draped over his shoulders, metal hooks jangling, the firefighter made his way across the street to the Law Courts Building. It didn’t take long for word to get out that a teenage prisoner [in legal jargon, a ‘Young Offender’] had died violently at the Courthouse. I went to the fourth floor of the Provincial side and noticed an unusually high number of guards milling about Courtroom 444, Youth Court. There was sure no welcome mat that day. The officers looked tense, their eyes shouting what their lips feared to say: Piss Off. The explanation we reporters got initially from the Alberta Government was that a Young Offender had somehow fallen down an empty elevator shaft. “How the hell did that happen?” I asked a PR person. “Aren’t there doors to prevent that?” The explanation was that an investigation was underway and everything would come out in the wash.
We were hoping not a whitewash. More often than not, when reporters are covering a story, bureaucrats are covering their asses. The firefighter used his rope to secure a damaged elevator door, hanging precariously off one of the cables and in danger of plummeting down the shaft. Five stories down was the still body of a teenage boy, suspended in the air, his neck wedged in a metal bracket. Kyle Young was handcuffed and shackled at the waist. His feet, in chains also, dangled about a meter off the concrete floor. When I saw police photographs of the dead teen hanging in mid-air — handcuffed and chained — I realized why the firefighter was so ticked. My reaction when I saw the pictures? “WTF??? …” They are photos I wish I’d never seen. I can’t delete them from my head. Edmonton Police showed up, but not right away. That’s because no one notified them about the suspicious death — for at least half an hour. The death of a teenager at the Law Courts Building soon morphed into a national news story, with reporters scurrying about, looking for fresh angles and ‘scoops.’ The competition was on. Day One went to the Edmonton Sun for being the first to publicly identify the Young Offender. Its competitor, the Edmonton Journal, followed the next day with the boy’s name. Day Two belonged to CHED Radio. Our newsroom got a tip that a teen who’d been in a holding cell closest to the elevator, just around the corner, had heard [… but not seen] everything. The morning after Kyle’s death, I found the youngster outside a courtroom on the fourth floor. He was sitting with his mother and so I asked her, “May I speak with your boy about what happened yesterday?” She glanced his way and said, “It’s your choice, son.” He nodded yes. At that point, a court-appointed lawyer intervened and told the kid not to say anything. That was my cue to ask the youngster and his mother to come to my office, a couple of floors down, where we’d talk. And so off we went. The teen revealed there had been a lot of loud banging, and when the elevator door broke free, he said, his cell shook. I asked him if he had heard any screams, and he said no. Strange. A youngster had plunged five floors to his death. One would think he would’ve yelled something. Christ, how tough was this guy? I know if I had fallen like that, I sure would have screamed. A video camera was aimed directly at the elevator door, but no tape ever surfaced. Guards claimed the camera wasn’t set up to record. However, the youngster said that immediately after the incident, he witnessed guards hurriedly carting away recording equipment. I couldn’t help but wonder if everything had in fact been recorded — and the evidence subsequently destroyed. At the inquiry that followed months later, two Courthouse guards [now known as Sheriffs] admitted pushing the youngster up against the elevator door but maintained they were only trying to restrain him because he’d allegedly been verbally abusive and threatening. One guard even testified that Young asked to be bruised. The elevator door suddenly swung open, the guards said, and down the lad fell. Strange, they didn’t think to hold onto him. In any case, that was their version of events. Kyle of course never got to give his side of the story. Not only the firefighter was disgusted. 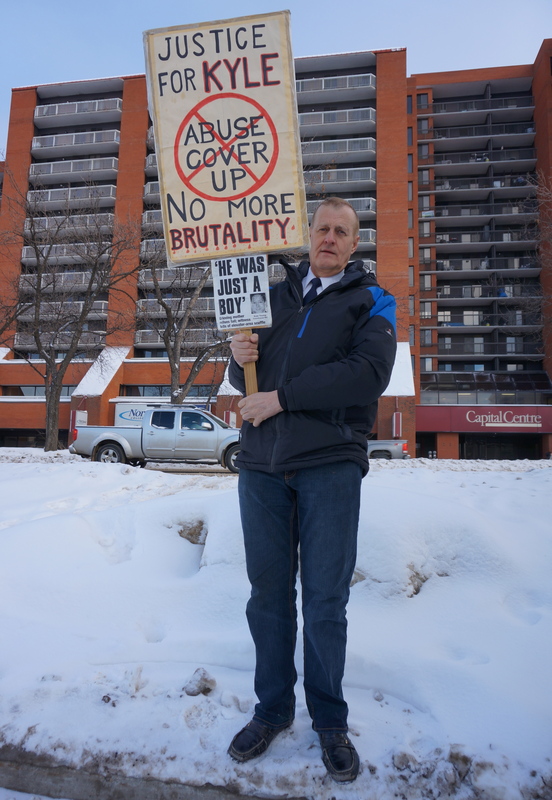 A commercial pilot, Rob Wells of Edmonton, protested on the Courthouse steps, walking back and forth and holding a sign that read: ‘Justice for Kyle … [No] abuse cover up’ and ‘No More Brutality.’ The other side read, ‘Stop Killing Kids’. Wells felt strongly that Kyle’s death was not an accident. The northeast entrance of the Courthouse is a busy place with hundreds of people coming and going every day. Some had words with Wells, but most walked right by him. It was the Nobel prize-winning author, Isaac Singer, who wrote, “What a strange power there is in clothing.” Wells came to that same conclusion when he protested outside the Law Courts Building. When Wells didn’t dress up, people asked him if he was Kyle’s father — but when he wore a suit and tie, they wanted to know if he was Kyle’s lawyer. Fowler, who had studied for the priesthood, later told me that what happened to Kyle Young was wrong. 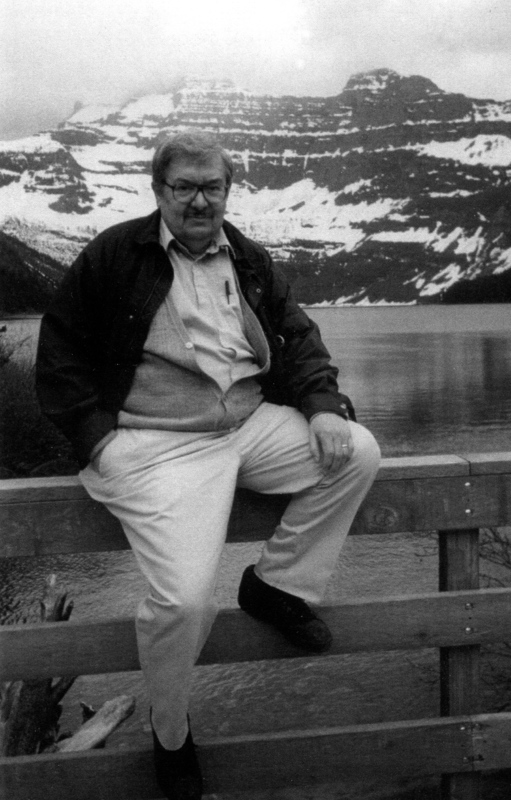 Stan was a thoughtful, gentle human being and a good friend. I liked him because he had more passion for fair play and justice than legal technicalities. Stan died from brain cancer on January 6, 2012. He was 68. In the summer of 2004, I interviewed Rob Wells about why he felt the way he did about the death of someone — in this case, a troubled teenager he didn’t know. We chatted on the sidewalk on the east side of the Courthouse. Wells didn’t hold back in saying he strongly believed there had been a cover-up — and a blatant one at that. A ‘bombshell’ hit while I was talking to Wells. A guard, clearly agitated with the protestor, walked up to him and made a gesture that could be best described as a death threat. The officer raised his hand, then dropped it suddenly, complete with sound effects … as if to mimic someone, say, plunging down a shaft. “The threat showed the mindset of people in the system,” Wells surmised. The day after the news was broadcast on CHED Radio, both Wells and the mother of Kyle Young got a phone call — and an apology — from the Provincial Solicitor-General. Wells was then called to a meeting with Mel Bertsch, the guards’ supervisor, with Wells requesting that the guard not be suspended or fired. Good for Wells. I too was called to a meeting with Bertsch. I too expressed the same sentiment. The official revealed the guard had fessed up to making both threats. I give the guard credit for being honest. He could have had a “convenient memory loss” [lawyer-speak for lying through one’s teeth], but the guy came clean. The guard remained on duty. When he and I met again, at the Courthouse, we shook hands. He was no longer agitated. An inquiry held months after the mysterious death, raised more questions than answers. An official with ThyssenKrupp Elevator testified that an inspection of the elevator just a month prior showed that everything was in perfect order — and that the metal safety pin which prevented the door from opening was not only in place but in good shape. However, when police investigators finally showed up the day Kyle was killed, the sheared-off metal safety pin was nowhere to be found. What happened to that important piece of evidence? Because of pressure that had been applied to the elevator door, the metal bracket at the top of the door was bent at a right angle. Critics pointed out this was clearly not the case of someone gently pushing on the door … the kid had become a human battering ram. In a further incongruity, it also came out at the inquiry that five hours had passed before Edmonton Police detectives interrogated the two guards. Five hours. By then, the pair had received legal advice from a defence lawyer in a fast-tracked meeting at the Courthouse. Based on an investigation by the Edmonton Police, the Crown’s office in Calgary decided there was “insufficient evidence” to charge anyone in connection with the death of Kyle Young. Could Kyle have rammed the door open on his own, with the two guards doing nothing to stop him? Not likely, according to his mother, Lorena Young. During breaks in the hearing, the tearful woman pointed out that her son weighed 123 pounds [55.9 kilograms], and that because he was both handcuffed and shackled, he was also restricted in how much force he could exert. According to Mrs. Young, her son had spent six months in jail for car theft and was completing a high-school course at home. Kyle Young in Holding Cells [from a video shown at the inquiry] Courtesy of Global News. He added that Kyle didn’t appear to be fighting back and kept saying, “All I want is some food, man.” Owing to the fact the teenager was both handcuffed and shackled, he had no way of defending himself. He was at the mercy of the guards. In just minutes, Kyle went from meeting two aggressive men to meeting His Maker. An autopsy revealed that Young’s head had been cut, the result of it striking a protruding bolt more than a meter straight away on the inside of the elevator shaft. That meant that when the elevator door broke free from its restraints, Young was flying horizontally. So much for a door suddenly opening when Young was ‘held’ against it. In what could have passed as a scene from a Monty Python movie, a guard sitting at a desk close by testified he didn’t notice any confrontation nor hear any banging because he was busy reading the Criminal Code of Canada. Things got really quirky when another guard revealed he had discovered “problems” with the elevator door [it kept coming loose] and had outlined his concerns in a memo, which he produced at the inquiry. It became known as the ‘phantom memo’ since nothing had been said about it at the time of the boy’s death. As well, nothing was ever done about the problems the guard had pointed out in his alleged memo. Hang on. If the memo wasn’t a fake and the elevator door was coming loose from its hinges now and then, why wasn’t this potentially fatal problem taken care of lickety-split? And if the door was so unsafe, why were two burly guards shoving a boy up against it? Was Kyle hit so hard the safety pin was sheared off? The inquiry, headed by Judge Jerry LeGrandeur, cleared the guards of any wrongdoing, concluding they had not used excessive force. The way LeGrandeur saw it, because of a mechanical problem, the door gave way and swung inward like a closet door, suddenly popping off its track. Chris Chambers, one of the guards involved in the suspicious death, remained on the job at the Courthouse. The other officer, Ali Fayad, quit his job at the Law Courts Building and joined the Royal Canadian Mounted Police. He was then posted to Fort McMurray in Northern Alberta. Wells wondered if any of the Courthouse guards was on steroids. The head of the Edmonton Police Association was quoted as saying that people compare steroid-using cops to Ben Johnson [disgraced Canadian athlete who got caught using performance-enhancing drugs], but he claimed there’s a difference because Johnson denied using steroids, and the cops have admitted it. The vigil, on the west side of the Law Courts Building [across from City Hall], was also attended by more than a dozen members of the Edmonton news media. Former New Democrat MLA Jim Gurnett, who organized the event, said he wanted people to remember what happened to Kyle. Lorena Young was reminded not to talk about the amount of money the family got from the lawsuit stemming from Kyle’s death. Protestor Rob Wells — who wasn’t alone the day of the vigil — recalled how upset he was in 2004 when he heard on the news that no charges would be laid in connection with the suspicious death. Lawyer Tom Engel didn’t mince words. He said the police investigation was nothing more than a coverup … to protect the system. Amanda Young read a poem about her kid brother. I recalled seeing Amanda ten years ago. She was at the inquiry, sitting alongside her mother, the pair sharing tears and comforting each other. That’s another image I can’t delete. While people bowed their heads, Audrey Brooks said a short prayer for Kyle. Folk singer Maria Dunn then followed with a song about the dead teen. The makeshift memorial for Kyle Young outside the Law Courts Building in Edmonton. Photo by Author on 22 January 2014 on the 10th anniversary of the teen’s death. How can anybody have any faith in a justice system like this? It was blatantly obvious from the evidence and a rudimentary knowledge of physics, that this was a deliberate act. This is another major failure of the Canadian justice system. Thanks for bringing this back to the public’s attention. I find it interesting that if the guards only lightly shoved the prisoner into the elevator doors and they let go, allowing him to fall to his death, why wasn’t there a lawsuit filed against the elevator company for wrongful death? If I were in charge of the company, I’d have my own investigation done by a neutral company clearing ThyssenKrupp of any wrongdoing. By the way, ThyssenKrupp are the same folks who maintain the elevators in our six-story building. Perhaps someone in the system with some morals and grit would look at this as a true cold case file. As always Byron, this is powerful reportage. It seems legal systems, sometimes called “justice systems,” fail their communities more often than not. Here in Las Vegas we get our share of similar issues. 14 years later, and the government is still covering up. 741 children died while in care or associated with Alberta Social Services since 1999. Does “CRIME AGAINST HUMANITY” sound appropriate???? Byron, Thanks for writing about, remembering and honouring my little brother. He is gone, but now I have an angel forever. Edmonton’s own version of Ferguson, Missouri. ← Crime, Punishment … Salvation?